Kitty Rambles A Lot: Dreaming of the January Sale! Dreaming of the January Sale! So the January sale has started in a major way, and there are some seriously amazing pieces on sale at all your favourite websites. Here are some of my top picks! The print on this dress is so lush! I think it would be gorgeous to wear to a spring wedding or event. It's such an unusual pattern, I love it. I have decided I really like gilets after many years of not, and this furry wine coloured one is adorable. I love the styling in this photos with it as a statement piece over all black. This is the sort of dress that is such a great transitional piece. The lace sleeves make it a little cooler to wear than full sleeves, but also mean you don't have bare skin out. And it's a real bargain for only a tenner! The colours in this are so pretty, and the hot pink strap is such a fun touch! Perfect to glam up any outfit. This dress has such pretty motion, I'd want to twirl and twirl and twirl! I got a Ragged Priest scarf for Christmas and it's so awesome, so I had to feature one in this! The colours are beautiful and they are really long! This is so adorable! I think you could dress this up or down really easily, I've been looking at this for a while and it is so tempting me to order it! 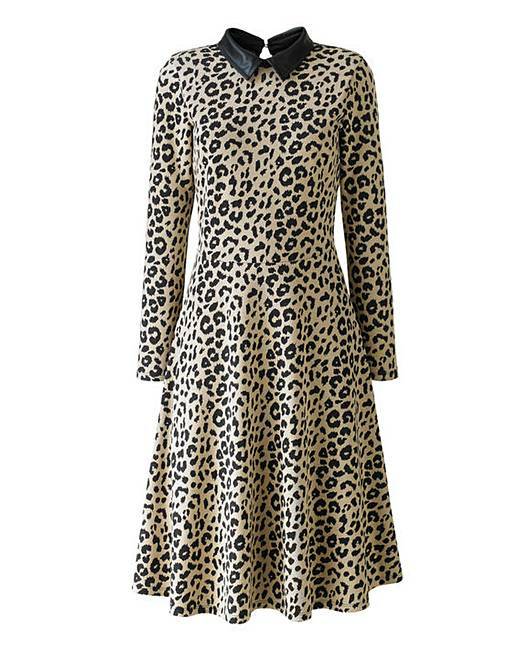 PU and animal print is totally my sort of thing! This is another dress that could be really versatile for spring. Pink Clove have quickly become a favourite company of mine this year, and this dress is so pretty. The oranges and reds are just lovely and the shift style makes it very easy to wear. I love super quirky hangbags and SkinnyDip have the best. So much fun! What bargains have you picked up in the sales? Find out what I got for Christmas in my newest YouTube video! Oh, god. Some of these are so gorgeous! I've had to avoid looking at the sales so I don't get too carried away, but I love most of these - especially the SkinnyDip bag! That's adorable. they have such a fab range of bags, so much quirky stuff! Love the ASOS Curve dress - it's like a circus in a dress which can only ever be a fantastic thing! That cross body bag is BEAUTIFUL! I adore it! Oh my goodness, the gillet and the Skinny Dip Glitter bag are so yum! And I can never resist a Lyra - I want them all!